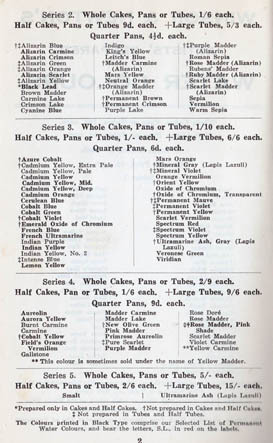 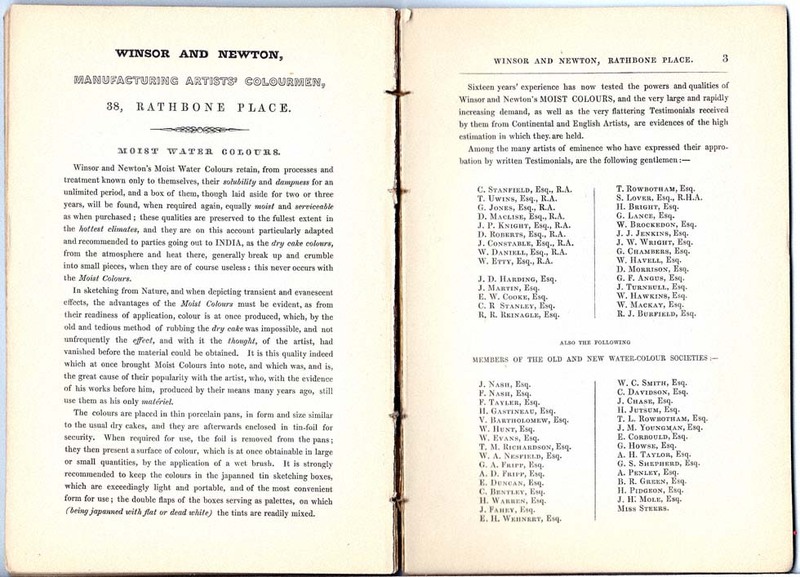 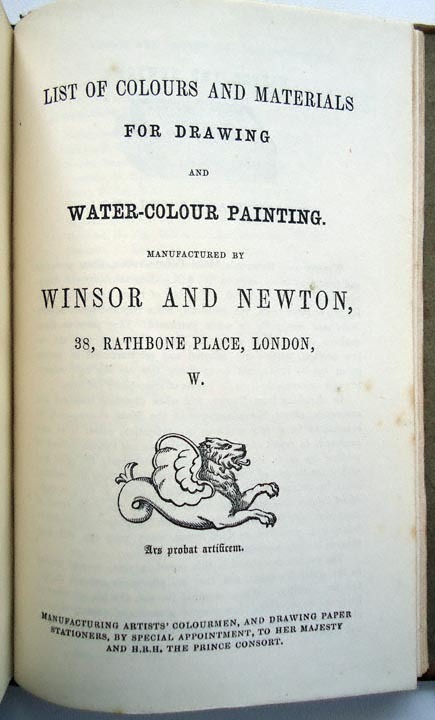 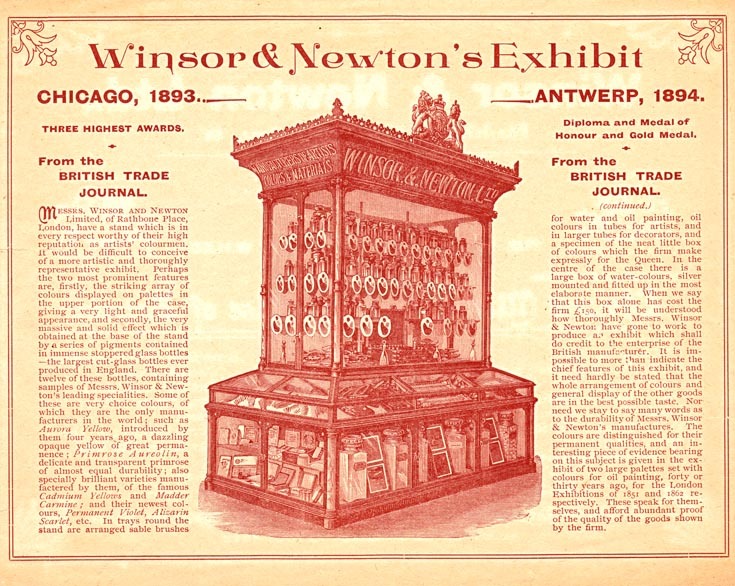 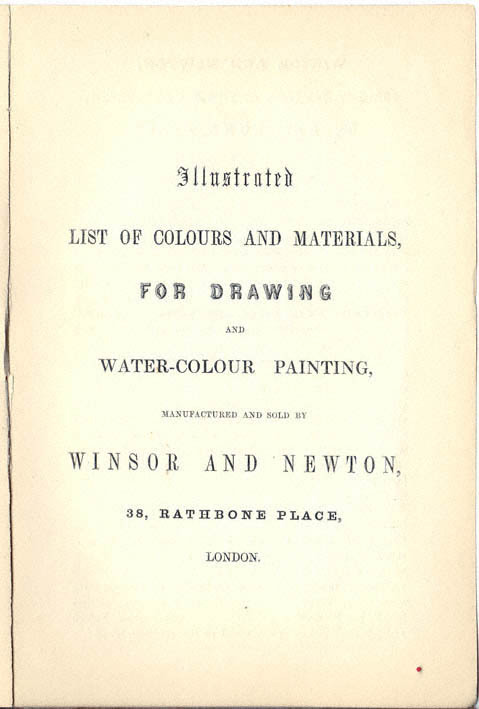 This 164+ year old version of the Winsor Newton catalog Lists watercolor supplies , paint, paper & brushes available to artists of the time. 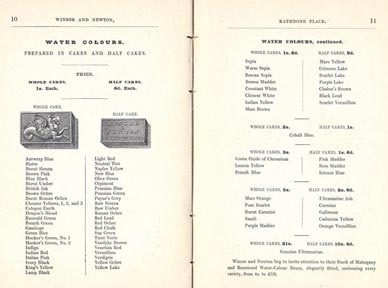 and sixteen years later would be 1848, when the catalog was written. 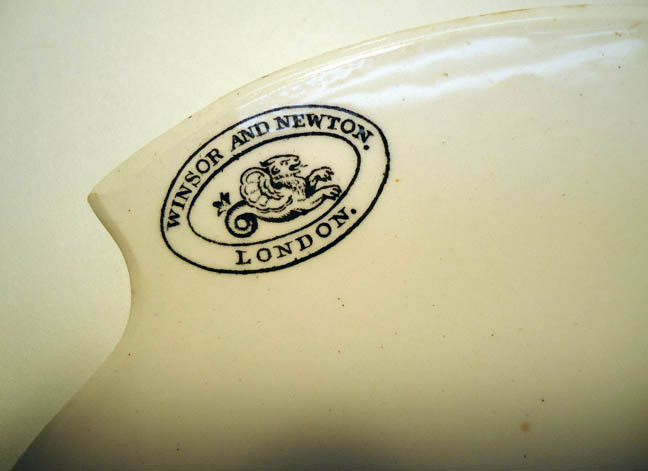 they produced where this one was found. 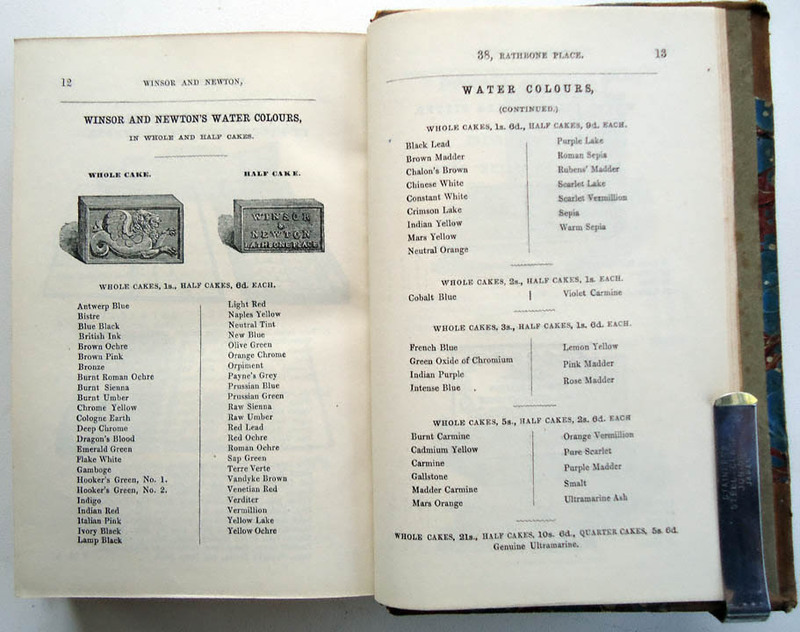 Click on images below to see full page -higher resolution photos. 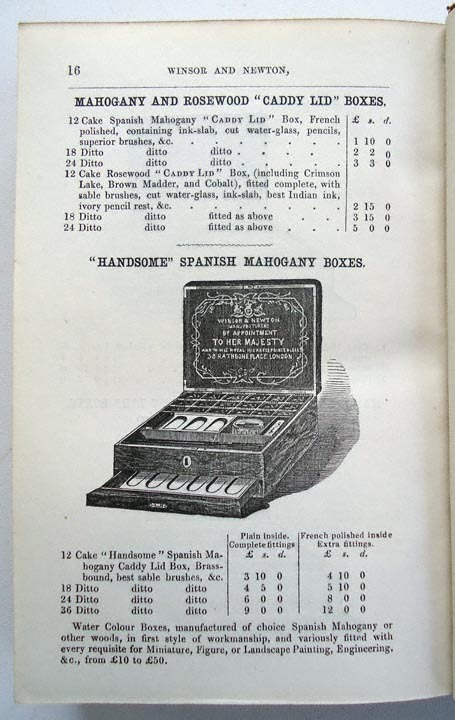 The items on this page are not for sale. 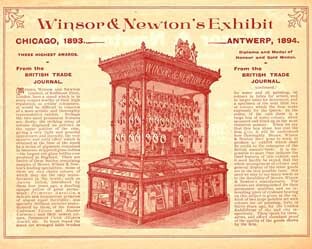 Photos are shown in the Virtual Museum for historic interest. 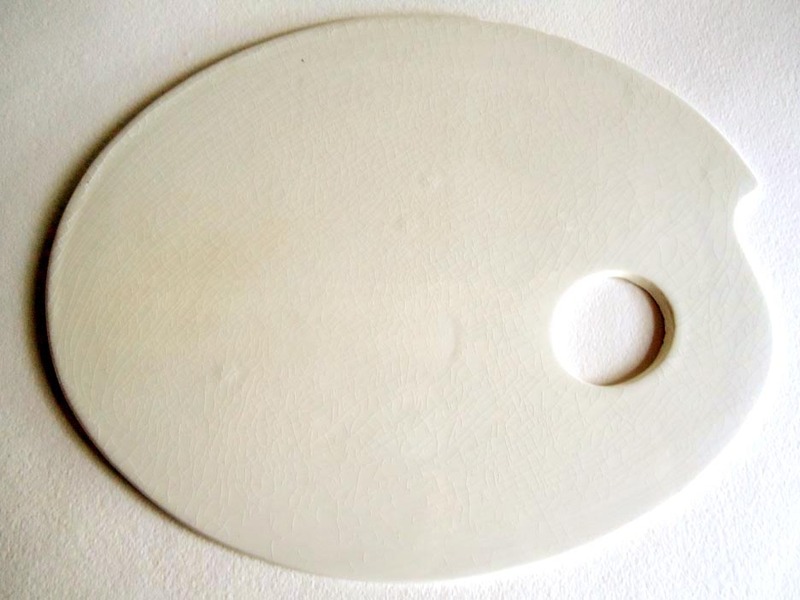 cannot be captured in any other media. 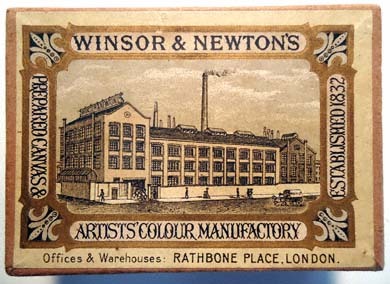 I believe earlier versions of this date range of packaging had no color borders in the wrap, see photo on left.. The SL on the wrapper indicates that they are in their Select List of permanent colors. 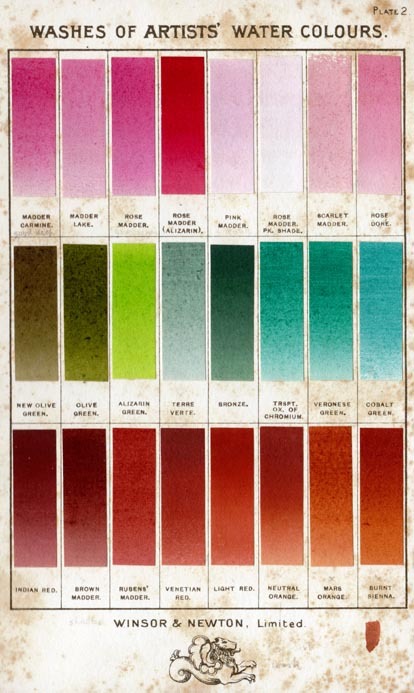 Some are no longer are as permanent as modern colors. 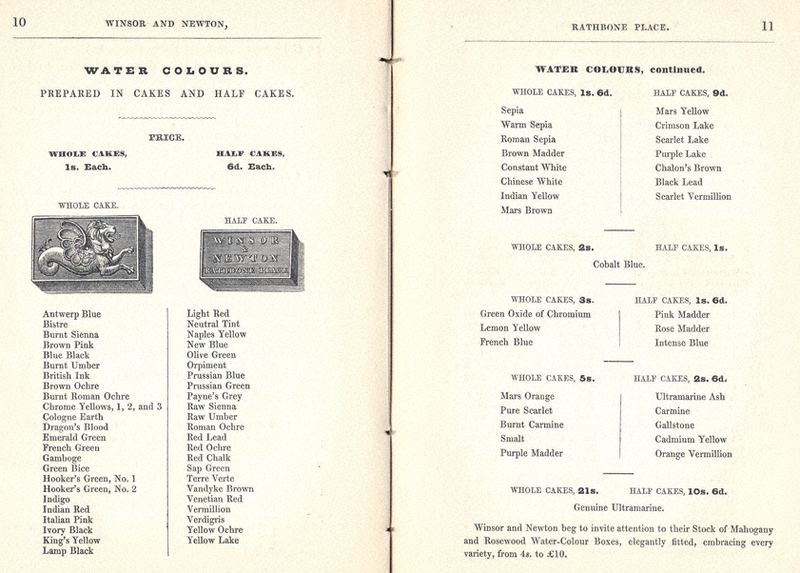 In 1835 Winsor & Newton introduced the first moist watercolor cakes using glycerine - & honey. 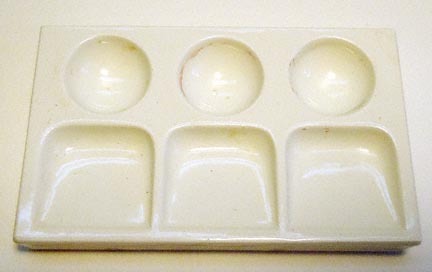 They were readily wettable making easier to use. 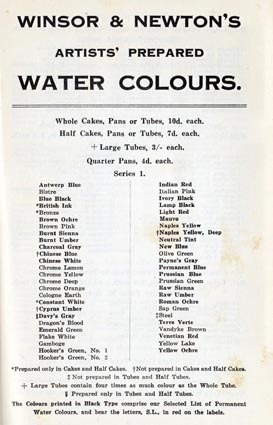 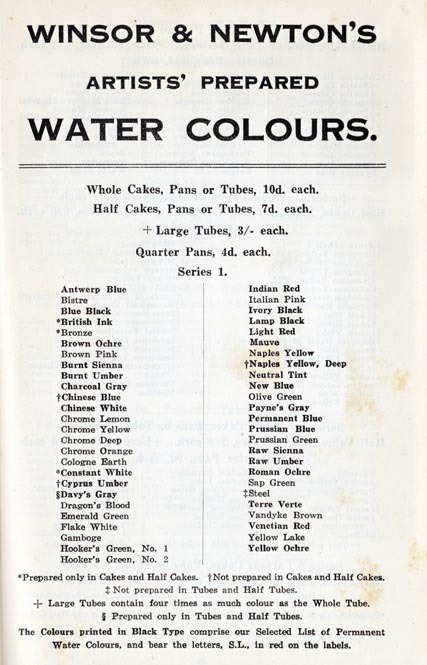 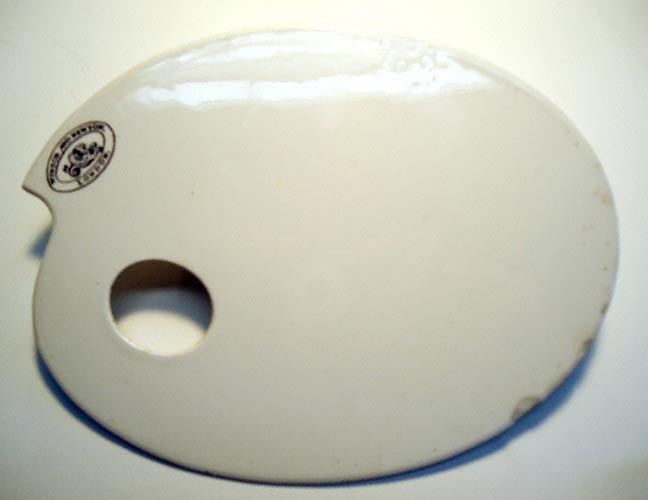 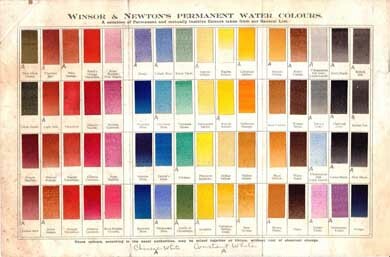 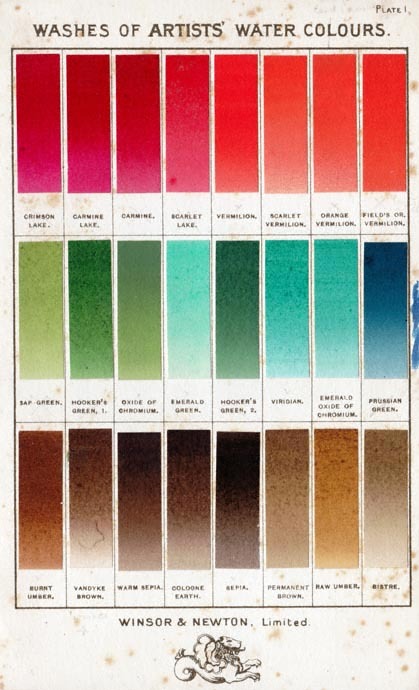 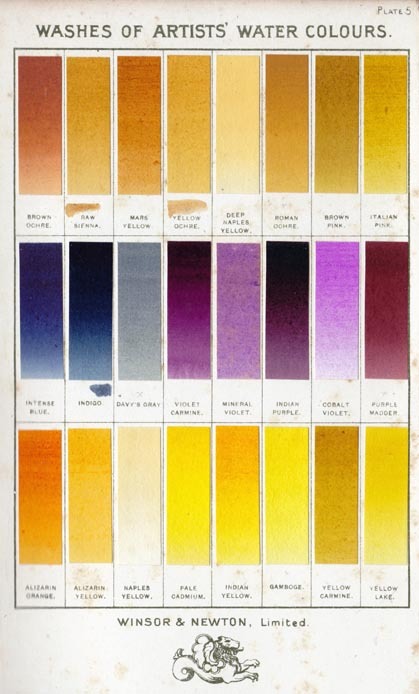 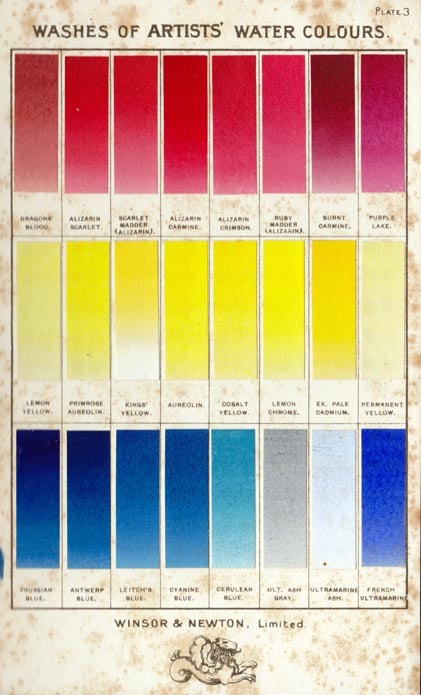 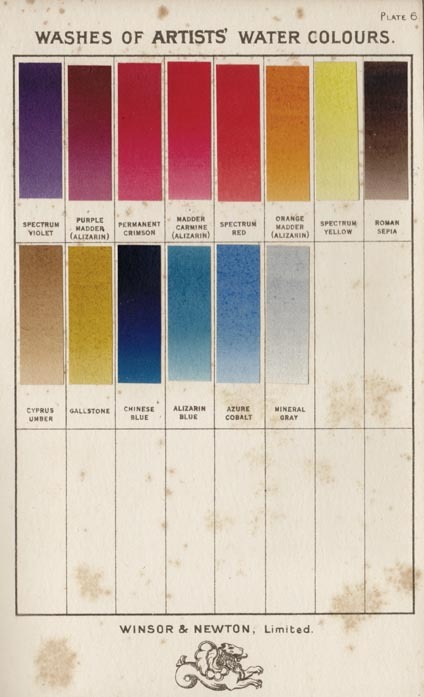 This and the new colors being invented by chemists contributed to the watercolour painting popularity in Victorian England- artists could paint out doors more easily. 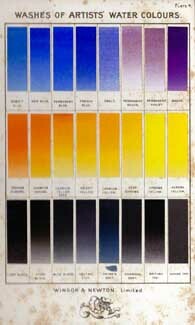 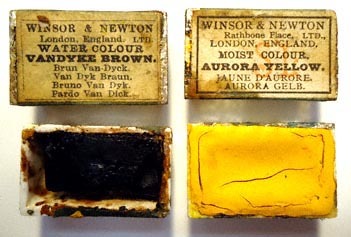 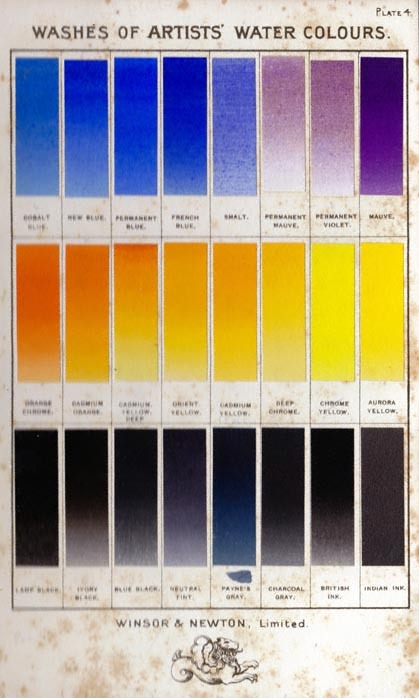 In the late 1880's Winsor Newton was the first company to spear head the discussion of the permanency of colors and which were likely to fade. 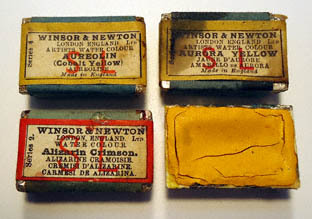 They began labeling their paints with a "SL" for their Select List of permanent watercolour paint. 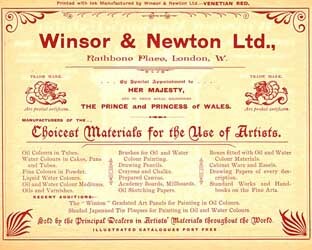 Queen Victoria & Prince Albert were great patrons of the arts encouraged the arts through many programs. 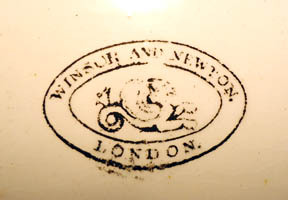 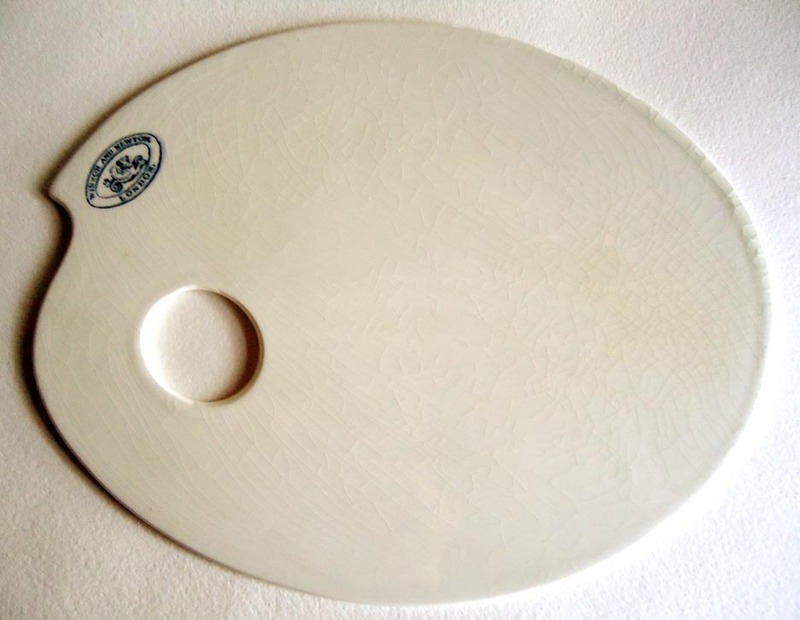 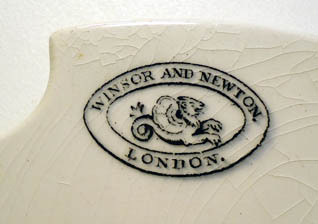 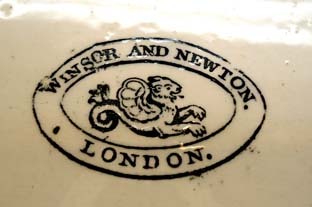 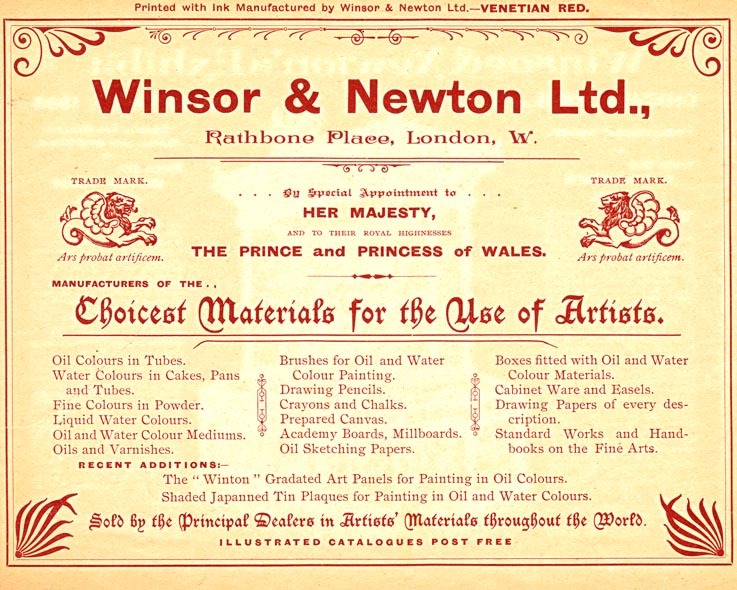 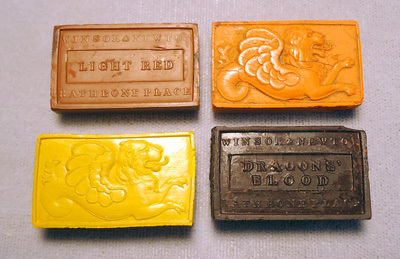 One way was to expand the royal warrants- providing a guarantee of quality of many art supplies. 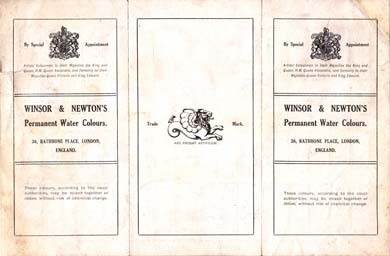 This warrant is carried forward by the royal family on everything from paint to cereal. 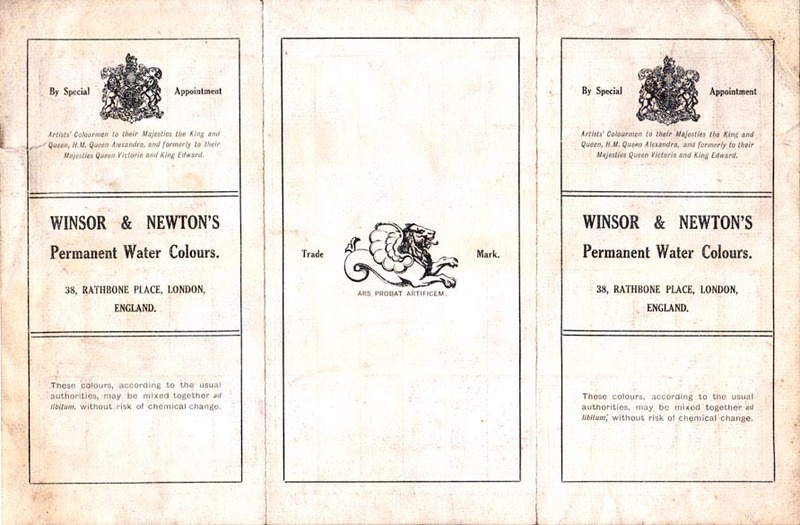 See the royal warrant seal in the upper right & left hand corner of the brochure below. 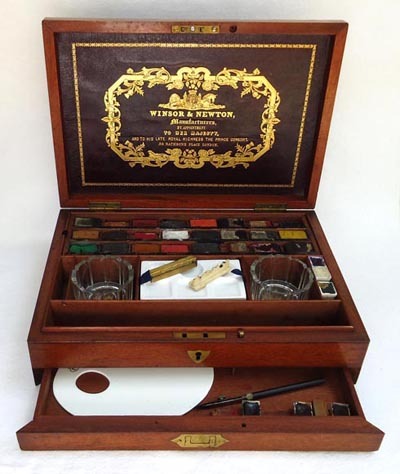 "By Special appointment ......"
It has a fine crazing due to age. 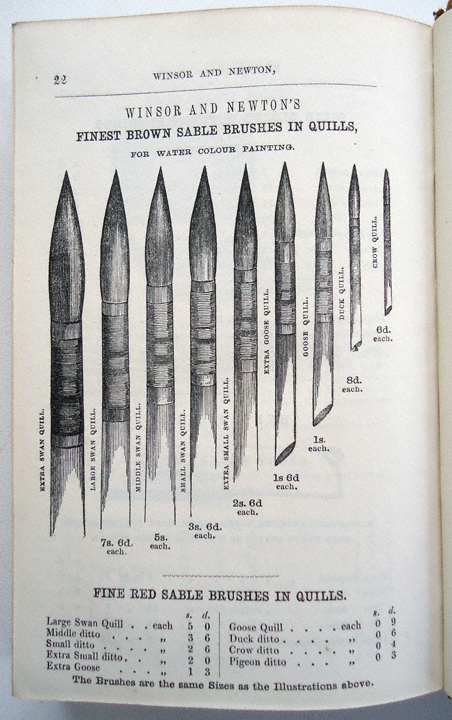 Not all of these are for sale , some are shown for historical interest.